The writings in Volume III mine a rich seam of correspondence, and include the first speech that Churchill made in the House of Commons. It examines his activities as a new member of Parliament—his determination to fight for the maintenance of Free Trade within the Conservative Party and his failure to do so—culminating in his decision to leave the Conservative Party and join the opposition Liberal Party, for whom he helped fight a successful election. He was then brought into government as Undersecretary of State for the Colonies. During this period he also wrote a two-volume biography of his father. 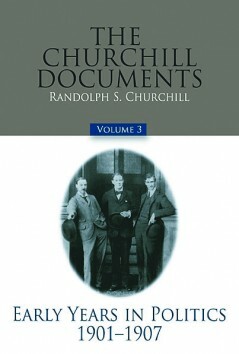 In addition to the Churchill Papers—now at Churchill College, Cambridge—this volume contains letters from the archives of those to whom Churchill wrote, and from the archives of the publishing company that published his book Lord Randolph Churchill. It includes Churchill’s letters to his mother, letters that range over every aspect of his public and private life. Included as well are letters from his American friend Bourke Cockran; from Frank Harris, who acted as his literary agent; and from Lord Hugh Cecil, his closest friend at the time, with whom he sought to break the mold of politics. The correspondence in this volume shows a young man in a hurry, but with strong convictions and clear abilities, on determined to make his mark on the national stage. Randolph S. Churchill, the only son of Winston Churchill, was born on May 28, 1911. Educated at Eton and Christ Church Oxford, he became a widely read journalist in the 1930s, reporting at first hand on the German elections of 1932 and warning of Hitler’s military ambitions. In the 1930s he fought three vigorous but unsuccessful campaigns to enter Parliament. In World War II, he served as an intelligence officer at General Headquarters, Middle East, and in the Special Forces in the Western Desert. In 1944 he volunteered to the parachute behind enemy lines to serve as a liaison officer with the Yugoslav partisans. For his war services, he was awarded the MBE (Military). For the five war years he was a Member of Parliament for Preston. He was three more times an unsuccessful candidate – in 1945, 1950, and 1951. Between 1938 and 1961 he edited six volumes of his father’s speeches. His own books include The Rise and Fall of Sir Anthony Eden; Lord Derby, King of Lancashire; The Six Day War, a history of the six-day Arab-Israeli war of 1967, written with his son, Winston; and the first two main and five document volumes of the biography of his father: Youth, 1874–1900 and Young Statesman, 1901–1914. A trustee of the Winston Churchill Memorial Trust and an honorary fellow of Churchill College, Cambridge, Randolph Churchill died at his home Stour, East Bergholt, Suffolk, on June 6, 1968.